Sometimes you need a unique experience. Something to change up your routine and spice things up. Whenever I feel the need for a new and fresh experience I play bingo at Bingo Cams. It feels like the first time each time I enter the rooms. I enjoy the unique experience at Bingo Cams. I always choose a room that has a live chat host. It's so much fun to be able to hear them chatting and answering questions. Cards were 5p each. I purchased 25 and got 6 bonus cards. The game began and continued very quickly. The chat host was Claire and she was extremely patient. 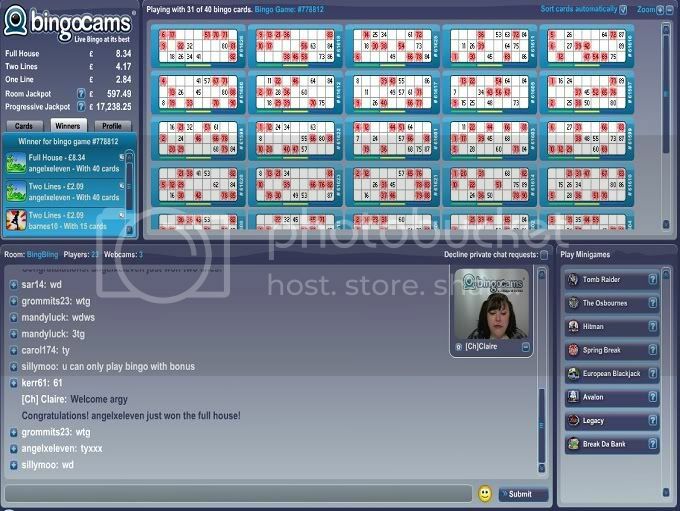 Players have the opportunity to ask questions and they tend to use the bingo rooms as live support. Someone got a little snippy with Claire and she was still very kind and tried to assist this player. She gained major points from me on that. There is no requirement to be a technology guru in order to play at Bingo Cams. I think some might have this impression because cams are involved. It's very straight forward and user friendly and there's no pressure or requirement to use a cam. I can't stress that enough. The line prize came and went and the same for the double line. I was one number away from the double line prize. When this happens you can hear a heart beating. I love that there're sound effects for the feeling of anticipation. I didn't know whether to watch my game or pay attention to the chat host. This live bingo thing is great and time flies when you're having fun. I couldn't have been further away from the full house. I was four numbers away when someone bingo'd and I wasn't even mad. I played all those cards for £1.25 and was thoroughly entertained. You can't put a price on the lively uniqueness you'll experience at Bingo Cams.